New Milford, the largest town in the territorial extent in Connecticut, is in the southwestern extremity of the county. It is bounded N. by Kent, E. by Washington, Roxbury and Southbury, S. by Newtown and Brookfield, and W. by New Fairfield and Sherman. It has an average length of 13 miles, and an average breadth of 6-1/2 miles, comprising an area of 84 square miles. The township is hilly and broken, several mountainous ridges extending through it. The soil is much diversified, and where susceptible of cultivation, it is generally good; but on the whole more distinguished for grain than grass. There are, however, large quantities of excellent meadow ground, but the pasturage is, on the whole, not abundant. It is essentially a farming town. Large quantities of grain are annually raised. The township is centrally intersected by the Housatonic: two branches of the Ashpetuck, Rocky and Still rivers, with other streams, enter the Housatonic in this town, affording numerous excellent mill seats. On Second hill, in the eastern part of the town, from two to three miles from the central village, are inexhaustible quantities of granite of a superior quality. There are also a number of extensive marble quarries in the town. The hatting business is carried on to some extent in Bridgewater society. There are 9 houses of worship in the town, 2 Congregational, 2 Episcopal, 2 Baptist, 2 Methodist, and 1 for Friends or Quakers. The following ancient history of the town of New Milford, is extracted from Rev. Stanley Griswold's sermon, delivered at New Milford, January 7th, 1801, which was by a vote of the town entered on their records. For these extracts, with some additional notes and other valuable information, the author is indebted to the Hon. David S. Boardman, of New Milford. *This tract was called Weantinogue. The original purchasers and proprietors were 109 in number, 99 of whom were purchasers of whole rights, and 10 of half rights: 24 shillings was the purchase of a whole, and 12 shillings of a half right. No individual had originally more than one right. The first division of land was granted in December, 1706, and was a home lot of 7 and a half acres and 10 acres for pasture. The 2d division was in May, 1712, of two lots of 40 acres each upon a right; ten other divisions were granted before 1760. New Milford first sent representatives to the General Assembly in 1725. It was the second town settled in the county. Woodbury was the first. "Afterwards an additional purchase was made, which forms the northern extremity of the town, and was called the north purchase. This was made in the year 1722. This town is now, I believe, the largest in territorial limits of any town in the state, and formerly was somewhat longer than it is at present. A part of it was set off on the south end, west of the river, to help form the town of Brookfield. Another part was set off on the northeast corner, to help form the town of Washington. Still, as it now remains, the longest right line through it from northeast to southwest is not far from 20 miles. "The first settlement that was made in this town by civilized people, was in the year 1707; so that New Milford has now been settled about 93 years. At that time a considerable number of the natives inhabited here, of whom there were reckoned about 200 warriors. They dwelt chiefly along the intervale by the river, a part of which intervale is to this day called Indian Field; and several of their burial grounds are yet to be seen in various parts of the town. Their graves are of a circular form, and the persons were buried sitting up, as in a natural position, on the ground. For some time after the white people came here, an Indian chief or sachem, named Werauhamaug,** had a palace standing near the Great falls, where he resided. **Werauhamaug.........He was so considerable a personage as to have reserved, as his hunting ground, a considerable part of the present society of New Preston, which always, until the incorporation of the town of Washington, of which it is a part, was called Raumaug, after the original proprietor, dropping for convenience sake, the prefix we. I have often seen the grave of this chief in the Indian burying ground, at no great distance from his place of residence; distinguished, however, only by its more ample dimensions, from the surrounding graves, out of many of which large trees are now growing. There is a similar burying ground on the west side of the river, opposite to and in sight of our village (New Milford), on the bluff, bounding the Indian field, so called and contiguous to Fort Hill, the site of the last Indian fortress known to have existed in this town. "On the inner walls of this palace, (which were of bark with the smooth side inwards), were pictured every known species of beast, bird, fish and insect, from the largest down to the smallest. This was said to have been done by artists whom a friendly prince at a great distance sent to him for that purpose, as Hiram to Solomon. In this palace, the forementioned chief was visited by the Rev. Mr. Boardman, first minister of this town, during his last sickness, and at his death. Mr. Boardman has left in manuscript, a minute and circumstantial account of his labors with the sachem to enlighten him in right Christian doctrines, as also the singular, rude, and abusive behavior of the other natives on the occasion; from whence it appears that a few or none of those people, (the sachem excepted), were disposed at that time to embrace Christianity; and so far as those people in this town and its neighborhood were ever converted to the Christian religion, it was a considerable time afterwards, by the Moravian missionaries. Count Zinzendorf himself came to this town and preached here. After the conversion of the natives by the Moravians, they quitted their settlements here on religious accounts, and removed to Bethlem, in Pennsylvania, where the brethren of that communion chiefly resided. But finding it very unhealthy for them there, and a large number dying, the remnant removed back again, where they have lived and gradually dwindled ever since. ** The natives had sundry fortresses, or military stations, in and about this town, to guard against attacks from distant tribes. Some spots in the town bear an allusion to this day, as Fort Hill, Guarding Mountain. **When the Indians returned from Pennsylvania, as mentioned by Mr. Griswold, few of them took up their permanent residence in this town. They joined the Scatacook tribe, but used for a long time in the season of fishing, annually to revisit their fishing ground at the Great Falls, two and a half miles below the village, for the purpose of taking lampreys, their favorite fish, which are not found above these falls. This stand they never would part with, and though occupied by the whites also for the same purpose, the Indians' rights were always recognized, and even to this day, when a straggler comes there, the whites allow them their turn. The Scatacook tribe are not quite extinct, and the few who remain, are under the care of an overseer appointed by the state, and who annually reports the state of their affairs to the county court of this county. Scatacook is situated in the town of Kent, and the account of it belongs to that town, and not to New Milford; and I only add this note to guard against a possible misconseption of Mr. G.'s meaning in the place noted. "It has been said that all the tribes along by this river, from its source to the sea, were in strict alliance and friendship; and that by means of certain sounds made on their guarding heights, an alarm might be spread in the space of three hours, through the whole line of tribes, a distance of near 200 miles. The natives were generally very friendly, and serviceable to the first settlers of this town, by defending them from hostile attacks, and by supplying them with such provisions as they could furnish. They had several reserves of land made for their accommodation in and about the town, as for a considerable time the Indian field, so called, the place once called Raumaug, (from the name of the sachem before mentioned), now in the parish of New Preston; the Great Falls, which they reserved for the fishing of lampreys; and lastly, the place where they now reside, called Scatacook. The two former they sold many years since, the two latter they still own. But their number has ever been diminishing since the neighborhood of the the white people, and at this time they are reduced to a mere handful. So much for the natives. "The first white settler who came to this town was John Noble, from Westfield, state of Massachusetts, who came here in the year 1707. He brought with him at first one of his daughters, then about eight years old. He first built him a hut under what is called Fort hill, but afterwards removed and pitched here, in the present center of the town. His house here was for some time the last house on this side of Albany, and Gen. Nicholson once lodged in it, in the wars under the reign of Queen Anne. It deserves to be mentioned, to the credit of the natives, that Mr. Noble once left his little daughter here, 8 years old, alone with them, for the space of three or four weeks, while he was necessarily absent from the town, and on his return he found she had been well treated, and taken exceedingly good care of. "It is impossible at this distance of time to ascertain the exact order in which the subsequent settlers came to this town, or the identical years in which they came. It is presumed, however, that we have obtained by diligent search and enquiry of the aged, somewhere near the order of their coming, as also the places from whence they came. We shall first mention the names of those who came more than 60 years ago, (whom we may consider the first settlers), together with the places whence they emigrated, settling them down in the order in which it is supposed they came, viz. John NOBLE, Westfield; John BOSTWICK, Stratford; Zechariah FERRISS, Stratford; Samuel HITCHCOCK, Springfield, Mass. ; Samuel BROWNSON, Farmington; Roger BROWNSON, Farmington; John WELLER, Springfield; Jeremiah CANFIELD, Milford; Daniel BOARDMAN, Wethersfield; Samuel CAMP, Milford; Theophilus BALDWIN, Milford; Ebenezer BALDWIN, Milford; William GAYLORD, Windsor; James HINE, Milford; Daniel HINE, Milford; Joseph WARNER, Hadley, Mass. ; John WARNER, Hadley, Mass. ; James PRIME, Milford; John WELCH, Milford; Paul WELCH, Milford; Thomas PICKETT, Danbury; Jonathan BUCK, Wethersfield; Enoch BUCK, Wethersfield; Ezekiel BUCK, Wethersfield; Henry GARLICK, England; Eleazer BEECHER, Milford; Joseph RUGGLES, New Haven; Nathan COLLINS, Milford; Joseph COLLINS, Milford; Amos COLLINS, Milford; Ezekiel PAINE, Rhode Island; Samuel PEET, Stratford; John PEET, Stratford; Thaddeus PEET, Stratford; Thomas OVIATT, Milford; Gamaliel TERRILL, Milford; Nathan TERRILL, Milford; Job TERRILL, Milford; James TERRILL, Milford; Caleb TERRILL, Milford; Joseph MURRAY, Westchester, N.Y.; Josiah SMITH, Danbury. "The first white male child born in this town was the late Lieut. Daniel Bostwick (the youngest son of John Bostwick, the second settler who came here); and the first female was Mrs. Sarah Noble, formerly Ferris, now living. And it is worthy of remark, that three persons have lived in this town to be more than 100 years of age, two of whom are now living. "The early part of the settlement here was somewhat retarded by a tedious lawsuit, regarding the title to a considerable tract in the center of the town. Col. John Read claimed it, under a title from the natives, and removed here to gain a residence and defend his title. This discouraged settlers under the company's title from coming on, and but a small number came the few first years. These few, like all other first settlers, saw troublous times; and their names are worthy the affectionate remembrance and praise of their posterity. It was common for them to carry their fire arms into the field to labor, and they were obliged to provide a fortified house to resort to in time of danger; and they were sometimes reduced to distress, through the failure of provisions and the difficulty of supplying themselves. "The town plot or center was first laid out on the hill next east of the present center, whence that hill is to this day called Town Hill. Afterwards it was concluded to remove the center to the top of the hill next north of the present center, for which the first minister built and lived on that hill. But ultimately it was thought more convenient to place the center where it now is. "New Milford for a considerable time belonged to the County of New Haven; but after Litchfield County was erected, it was set off to the latter. It is ascertained from the papers of the first minister, that in the year 1712, there were but 12 families in this town. Col. John Read, who is mentioned before as having been once a candidate for the ministry, preached the first sermon that ever was preached here. After he left this place, his house, which stood near where the present town house stands, was used as a place of worship for some years. The first meeting house was built in the year 1720. It stood near the foot of the hill, a few rods to the northeast of the present town house. There the first minister, Mr. Boardman, officiated during his life; and the second minister, Mr. Taylor during some of the first years of his ministry. It is said by the aged that when they first began to meet in that house, though it was small, yet every person in the town could sit around upon the outer sills, side by side. "The house in which we are now assembled, being the second meeting house, was built in the year 1754, about 47 years ago. The first Episcopal church was built in the year 1746; the second, which is the one now standing, began to be built in 1765, was raised in 1766, about 35 years ago. It was finished and consecrated 1793. The Strict Congregationalists, usually called Separates, erected their house of worship in the year 1761, 40 years ago, which is now standing. The Friends, commonly called Quakers, built their meeting house not far from the year 1742, now standing, though in another place than where it was first set. Another communion of Friends, followers of Jemima Wilkinson, built a house of worship in the north end of the town about 15 or 20 years ago, but it is now owned and occupied by the Episcopalians of New Preston. The Baptists erected a house of worship in the south end of the town, called the Neck, (now Bridgewater society), about 11 or 12 years ago; but it is sold and now used for another purpose. "This naturally leads us to consider more particularly the several Christian persuasions, denominations or societies, contained in this town. The eldest here is the Presbyterian, or more properly the Congregationalists. Most or all of the earliest settlers were of that denomination. This society may therefore be considered as old as the town; but the professing members were not gathered into a church until the year 1716. It then consisted of 8 men and 5 women. There have been three ministers ordained in this society. The first was the Rev. Daniel Boardman from Wethersfield. He was ordained on the 21st Nov. 1716. He died Aug. 25, 1744, in the 58th year of his age, having served here 27 years and 9 months. It appears from his records, that he baptized 521 persons, and married 67 couples. The second minister was the Rev. Nathaniel Taylor from Danbury. He came first to preach as a candidate in January, 1748: was ordained the 29th day of June following. He died Dec. 9th, 1800, aged 78 years and 3 months, having been ordained 52 years and 5 months. According to his record, he baptized 927 persons, and married 349 couples. Myself, who am the third minister, came first to preach as a candidate June 14th, 1789: was ordained colleague pastor with the Rev. Mr. Taylor on the 20th day of January, 1790. I have baptized 232 persons, and married 103 couples. Many have been married by the civil authority, whose number I have not ascertained. "The next religious society in the order of time is the Friends, usually called Quakers. Their origin in this town was about the year 1731. Then 19 church members left the Presbyterian communion, and set up that society. About 10 years afterwards, they built their house of worship, which was set on a piece of ground which was given for that purpose, and also for the purpose of a burying place, by Zechariah Ferris, opposite the dwelling house of Mr. David Ferris. Since that time it has been removed to the place where it now stands, for the greater accommodation of the members; where they now hold their regular meetings, though the number is but small. "The next religious society in the order of time is the Episcopalian. Some individuals of that profession came into this town at an earlier period, but no stated worship was held here till somewhere between the years 1740 and 1745. Worship was then carried on here by the Rev. Beach of Newtown. One Mr. Barzillai Dean read service here for several years, then went to England for orders, with a view to settle here on his return, but died on his passage. The first Episcopal minister who came and resided in this town, was the Rev. Solomon Palmer from Cornwall. He came in the year 1754, and removed to Litchfield about the year 1760; was minister here about six years. The second was the Rev. Thomas Davis from Washington. He came here about the year 1761, and died in this town May 12th, 1766, in the 30th year of his age, and the sixth year of his ministry. "The third Episcopal minister was the Rev. Richard Clark from Milford. He was settled here in June, 1767, and left the town in 1787. The society was then vacant for a few years. The fourth Episcopal minister was the Rev. Truman Marsh from Litchfield. He was settled here in November, 1790, and left the town 9th of Nov. 1799, and removed to Litchfield. He was minister here just 9 years. Since then the society has been vacant. The next religious society in the order of time, is the Strict Congregationalist, commonly called Separates. This sprung out of the other societies in consequence of what is called the great revival of religion, or by others in the New Light time, between the years 1740 and 1750. Their first elder who preached statedly here, though he never was ordained over them, was Mr. Elihu Marsh. Their second was Mr. Robert Campbell, who was the first that was ordained over them. He was ordained here 29 years ago, continued about 12 years, and was then dismissed and left the town. Their third elder was Mr. Barnabus Lathrop, who came here about 10 years ago, and preached to them about two years. He afterwards joined the Presbyterian society, and died in this town April 10th, 1796, aged 57 years. Their fourth and now officiating elder, is Mr. Daniel Hine. He has been ordained over them 4 years. This society continued to maintain a separate worship till about the year 1812, when having become very small, the mambers, on the recommendation (as it is understood) of elder Hine, dissolved the society, and the principal part of them joined either the Presbyterian society or the Baptists. The next religious denomination that may be mentioned are the Baptists. It is but quite lately that communion assumed the appearance of a regular society here. A small church was formed, and a house of worship built in the lower end of the town, called the Neck (now Bridgewater society) about 11 or 12 years ago; but they never had an elder settled over them, and within a few years past they sold their house and chifly removed out of the town. A few scattered individuals remain, but no stated worship is performed. "The last denomination we shall mention is one which is now extinct from the town, but not many years since existed in some numbers, They are the Friends, called Jemimaites, gathered here by one Jemima Wilkinson. Between 15 and 20 years ago, a number of families in the northeastern part of the town, joined in that communion, and built a house of worship; but shortly afterwards they sold their house and private estates, and moved away in a body with their leader, into the western part of the state of New York, called the Genesee, in Ontario County. Their settlement was on or near the western shores of the Geneva Lake, about 20 miles south of the town of Geneva, where, though occasionally abandoned by some of her followers, Jemima continued for many years to maintain her ascendancy over her remaining followers, and even it is said until her death, since which nothing has here been heard of them, and it is supposed that the society as such has become extinct. A few individuals of other persuasions have been or still are in the town, such as Seventh Day Baptists, Scotch Presbyterians, Glassites and Methodists, but no society of these has been found. "Thus have I endeavored to sketch something of the ecclesiastical history of the town." "The first bridge that was ever built over the Housatonic river from the sea to its source, was built in this town, and was finished in July, 1737. The first school that was set up in this town, was in the year 1721: it was to be kept four months in the year, and the town to pay one half of the expense. At this time there are 22 school districts in this town, exclusive of those in the parish of New Preston; and it is computed that about 700 children attend them through the winter season." The village of New Milford consists of about 60 dwelling houses and 5 mercantile stores. The engraving shows the appearance of the central street, as it is seen from the south end. It is wide, and about 60 rods in length. The building which is seen on the right is the ancient Episcopal church, which was taken down the present year, and a new church is now erecting. 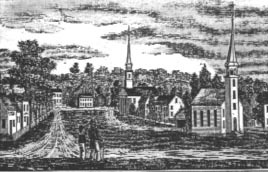 The Congregational church, erected in 1833, is seen to the north: the old church stood in the street, about 30 rods southerly from the one seen in the engraving. This place is 18 miles SW of Litchfield, 36 NW from New Haven, and 48 from Hartford. We hear from New Milford, that a manufactory has lately been opened there, wherein were wrought, or rather imitated, New York 40s bills of currency, and Spanish milled dollars, to a great degree of imperfection; but that, notwithstanding the present prevailing scarcity of money, and loud call for industry, it is thought that branch of business may prove prejudicial to the public, and therefore the artificers already labor under great discouragements from every quarter, and near one dozen of them embarrassed with a close confinement in a distant cage, where a bill is prepared upon some obvious specimens of their ingenuity, to assert their title to the Royal Bounty. Strange! how variously mankind distinguish themselves! no less by their actions than features. The Riflemen on their way from the southern colonies through the country, administer the new fashioned discipline of tar and feathers to the obstinate and refractory torries that they meet on their road, which has had a very good effect here. Those whose crimes are of a more atrocious nature, they punish by sending them to General Gage. They took a man in this town, a most incorrigible tory, who called them d___d rebels &c., and made him walk before them to Litchfield, which is 20 miles, and carry one of his own geese all the way in his hand: when they arrived there, they tarred him, and made him pluck his goose, and then bestowed the feathers on him, drummed him out of the company, and obliged him to kneel down and thank them for their lenity. The following inscriptions are from monuments in the grave yard in the central village. In memory of the Rev. Thomas Davies, a faithful servant of Jesus Christ, and active worth missionary from the venerable society in England, who departed his life May 12, 1766, in the 30th year of his age. He met death with the greatest Christian fortitude, being supported by the rational hope of a blessed immortality. Vita bene actae jucundissima est recordatio. Mrs. Ann Bostwick, the consort of Samuel Bostwick, Esq., died Sept. 21st, 1783, in the 59th year of her age. Brightens in bliss, and triumphs in his power. Samuel Bostwick, Esq. died Sept. 23d, 1789, aged 66 years. He was the 5th son of Major John Bostwick, who was the son of John Bostwick, who was the son of Arthur Bostwick, who migrated from ye town of Cheshire in England. In death the rational mind ceases to communicate to the living; a marble genealogy succeeds, and the grave becomes a monitor. In memory of Paul Welch, Esq., one of the first principal settlers of this town, and an original proprietor of the same, departed this life Aug. 26th, 1778, in the 82d year of his age. In his day he served the town in most offices of trust and honor, gave good satisfaction, and died possessed of a large estate. In memory of Samuel Platt, the first of this town, and one of its original proprietors, departed this life 22d July, 1783, in the 61st year of his age. An honest man, that feared God and hated wickedness. Rest here, my body, till the Archangel's voice, more sonorous far than nine fold thunder, wakes the sleeping dead; then rise to thy just sphere, and be my house immortal. Reference: Connecticut Historical Collections......History and Antiquities of Every Town in Connecticut......2D Ed. ; John Warner Barber, 1798-1885; Publisher: Durrie and Peck and JW, 1837.